Charles Deschamps Randall knew the Army environment for all of his life. The son of Colour Sergeant Charles Randall of 1st Battalion Sherwood Foresters, he was born in Bangalore, India on 7 May 1876 and baptised there 11 days later.2. His mother, Julia (née Channing) had been born in Madras, India in November 18553 and was therefore not quite 16 when she married Charles Randall (b. c1842) on 18th October 1871 at Madras4. By 1879, the Battalion had returned to England and, by 1881 was stationed at Aldershot, Hampshire - where Charles and Julie, now with a family of three, are to be found. Besides their son Charles, age 4, there was Amy, age 8 and Florence, age 2. Mary Channing, Julia's younger sister, age 15 was also with the family.5. Julia died in 1886 when Charles was aged ten. After attending Duke of York's School, in Chelsea and, as soon as he was able, aged 14, he enlisted, as drummer boy, in his father's regiment. From the very start, his ambition was to become Colour-Sergeant as his father had been. By the time of the South African War, he had achieved that ambition when he served throughout that time as Colour-Sergeant. He was awarded the Distinguished Conduct Medal for bravery in action. 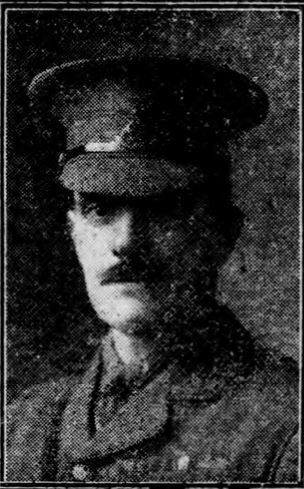 After serving five more years, during which he became Regimental Sergeant-Major, he left the army and came to live in Beeston, apparently with his father, at 46 Trafalgar Road and became an insurance broker, trading as Randall & Co, on Long Row, Nottingham. He also pursued his love of sport, particularly hockey, which he played for several seasons with the Beeston Hockey Club.6. At the outbreak of war, in August 1914, he rejoined the army and was soon commissioned, first as 1st Lieutenant and then as Temporary Captain with 9th Battalion. Sherwood Foresters, which had been formed at Derby on 24th August 1914. On the 1st July 1915, the battalion left England on the "Empress of Britain", sent to support the Gallipoli campaign which had been mounted, originally as a naval operation, earlier that year. It had been hoped that achieving its objective of capturing Constantinople would enable the Allies to link with the Russians, force Turkey out of the War and encourage the Balkan states to join the Allies. It was also hoped that another front would take some of the pressure from France and Belgium where operations and become bogged down and very costly in lives. However, the naval attack in February had been a disaster, with the loss of three battleships and three others badly damaged and, when military support was brought in, it too suffered heavy losses - not least, amongst the Anzac troops who were able to establish a bridgehead at what became known as "Anzac Cove". British troops struggled to establish themselves and the costly deadlock led directly to a political crisis in London, the resignation of the First Sea Lord, the Liberal government replaced by a coalition and Winston Churchill, as First Lord of the Admiralty, took much of the blame. “There has been a dust-storm blowing all day. We each of us are a mass of flies, and these factors, together with the excessive heat and most abominable stench, turn one from food, drink, sleep and concentration of purpose. We have not had many casualties during our ten days in the trenches, but the exceptional conditions which prevail are much worse than actual fighting. The front line of trenches is nothing but a huge graveyard, and many hundreds of bodies still lie unburied. As these are a month old they make their presence felt in many respects. “We were putting our wire entanglements a few nights ago, and to do so had to crawl through countless bodies, but contact with these was infinitely preferable to exposing oneself to a Turkish bullet. “There is no “off time” on the Peninsula, and the firing goes on forever. I am pleased to say the men are splendid, although they have not been put to a very severe test of fighting yet. We have earned a great deal of praise from the powers that be. I am in command of C Company now, Major Fielding  being killed the second day while talking to me. Our next period will, I think, be hell, as I must ask you to notice the casualty lists.”7. On the 1st August, the Battalion was relieved by French troops and sailed on the "Osmanieh" for Imbros on the same night and landed at Suvla Bay on the 6th of August and dug in. Tragically, the Suvla Bay operations met a determined and well prepared enemy in difficult terrain and soon become another costly failure, 9th Battalion moved forward during night of the 7th/8th to Hill 50 and attacked Ismail Oglu Tepe on the 9th, It was during this attack that the Battalion suffered heavy losses. 8 Officers and 150 men were killed or missing, and was reduced to about 300, many of them wounded. Many of these casualties, including at least six of the dead, were from Beeston. Captain Randall was one of those who fell and whose body was never identified. He, is amongst 20,878 Allied servicemen who are commemorated on the Helles Memorial who fell during the Gallipoli campaign and have no known grave. 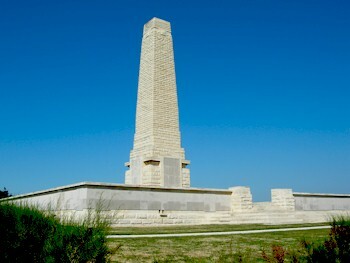 It stands on the tip of the Gallipoli Peninsula and takes the form of an obelisk, 30 metres high, that can be seen by ships passing through the Dardanelles. After settling his son's small estate8, Charles Randall, snr, moved from Beeston to live, apparently with a son from a second marriage, in Billingshurst, Kent. He died there on 6 December 19249. 2India, Select Births & Baptisms, 1792-1948 (Familysearch - FHL film 521864 Ref v57 p99) :Charles Deschamps Randall, b. 7 May 1876. Baptised Bangalore, Madras, India 18 May 1876. Son of Charles & Julia Randall. 3India, Select Births & Baptisms, 1792-1948 (Familysearch - FHL film 463298) : Julia Channing, b. 25 November 1855, Madras, India. Baptised 1 January 1867, Jackapatalla, Madras, India. Daughter of Richard and Lizzy Channing. 51881 Census : 45th Regiment Sherwood Foresters - probably the former 45th Nottinghamshire (Sherwood Foresters) : Aldershot, Hants - Piece 785 Folio 20. It was in this year that the 45th became 1st Battalion, The Sherwood Foresters (Nottinghamshire & Derbyshire Regiment), upon formation of this new Regiment. 6Based largely on his obituary in the Nottingham Evening Post, 24th August 1915 and details associated with the publication oh his last letter, in that newspaper on the following day. 7Extract from a letter from Captain Randall to a Miss Fielding, of Normanton, Derby, printed in the Nottingham Evening Post, 25th August 1915. 8Probate of Captain Randall's estate, valued at £133 14s, was granted to his father on 23 November 1915, at Nottingham Probate Registry. 8Probate of Charles Randall snr's estate, valued at £889 11s 2d, was granted to Sidney William Randall, an army pensioner, on 2 February 1925, at London Probate Registry.